A Thursday update?? It’s definitely not our norm, but we wanted to have an extra day to check this one in case any issues come up. A Thursday update?? It’s definitely not our norm, but we wanted to have an extra day to check this one in case any issues come up. We’ve upgraded all the server so there should no longer be any connection issues and filled up ports. Thanks for your patience while we worked on this! For this update, we’ve got the Tiny Epic Galaxies DLC by Gamelyn Games, the 1st Expansion to Darkest Night added and the brand new Multiple States! You can read more about it below, but it will really enhance your gameplay, especially for RPGs! 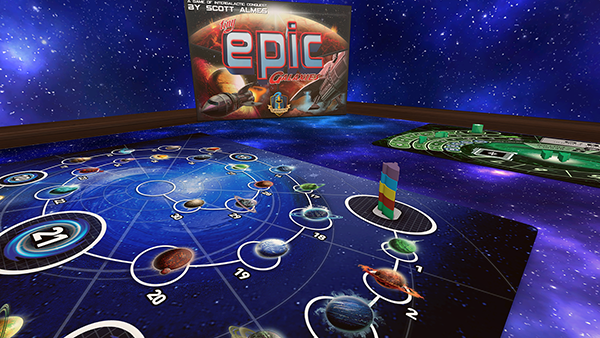 We’re happy to have partnered with Gamelyn Games to bring Tiny Epic Galaxies to life in Tabletop Simulator! Gamelyn Games makes different Tiny Epic games and their latest one is currently on Kickstarter – Tiny Epic Western! Check it out! Tiny Epic Galaxies is available for $4.99 with a launch discount of 10%. 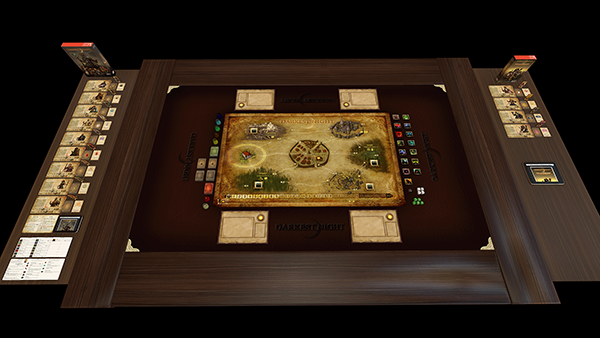 It can be played solo or up to 5 players! Only the host needs to own all of our DLCs. The Darkest Night DLC has been updated to include the 1st expansion for FREE! With An Inner Light introduces a quest system that requires the heroes to respond to crises throughout the kingdom and offers new ways to acquire items and powers. The expansion also adds four new playable heroes (the Crusader, Monk, Paragon, and Shaman) as well as new event and artifact cards. You can read more about the 1st expansion on Victory Point Games website. You can now create multiple states for a single object. Hover over the objects, right click and choose states. They will now be grouped into one object. When you hover over an object grouped into States, it will show an icon letting you know. You can use the number hotkeys (1,2,3, etc) to switch between them, or right click to get the States menu. Hovering over each number will tell you what the object is if you named them properly. States are great for making pages in a book, any kind of RPG for characters when they are changing their moods and much MUCH more! We’ve been working hard to get Linux working for tablet. So this is an experimental phase to see what we can get right. Please test this out and let us know of any issues that come up. Stacking cards will now remember name/description and any other extra attributes added to them. Cards held in player hands will not show their name. Cards flipped over will not show their name. This will be more important in the future with the planned search revamp. 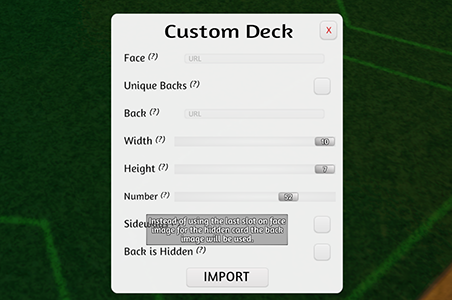 A checkbox has been added in the Custom Deck menu to choose whether you want the Back image to be hidden or not. Removed the Notes “show/hide” button as you can hide/show Notes in the new UI configuration menu. Description field added to tooltip when it’s hovered for long enough. (So it will now show where the “Name” tag is as well). Hand Icons have been added for bags, chips, cards, and states so you know what mode objects are in. Removed chat messages for the Blindfold to prevent confusion. Added 2D Text Tool Pointer when in use. Lift height of cards removed from hand / flicker when dropped. Cards and decks can now be picked up with sticky option on other objects. Reworked how ESC works by first removing all opens windows then opening the ESC menu. You can now use Tab to swap between name and description in contextual. Fixed issues with Magnify, ALT Zoom, & Line tool being usable through the blindfolds. Fixed issue chat font size not remaining persistent when going back to the main menu. Fixed issue with Reversi chip showing $0 tooltip. Fixed issue with getting error messages about the master server when hosting for a very long time. Fixed ALT Zoom double sided cards being mirrored on the back. Fixed issues with unsubscribing from Workshop on Mac & Linux not deleting properly. Fixed issue with grouping poker chips sometimes duplicating. Fixed issue with dummy hidden areas occurring when using the hotkey. Fixed issue with Lan not showing up on server browser. Fixed issue with ALT Zoom not letting you zoom on the sides of the screen with big objects. Fixed issue with searching cutoff names. Fixed issue with ALT Zoom not hiding your 3d pointers. Fixed custom deck issues with using the same urls for different deck settings. Fixed issue with Custom Model/Token falling through table when removed from bag if dropped before loading. Fixed issue with Blindfold disappearing before offscreen. Fixed issue with copy & pasting digital counter bringing back the initial 0’s. Fixed issue with flipping layered cards collision. Named objects hidden by player hands will no longer show their name when hovering over them.